Many Christians find private prayer a difficult duty, and thus they either totally neglect it, or are negligent in their performance of it. 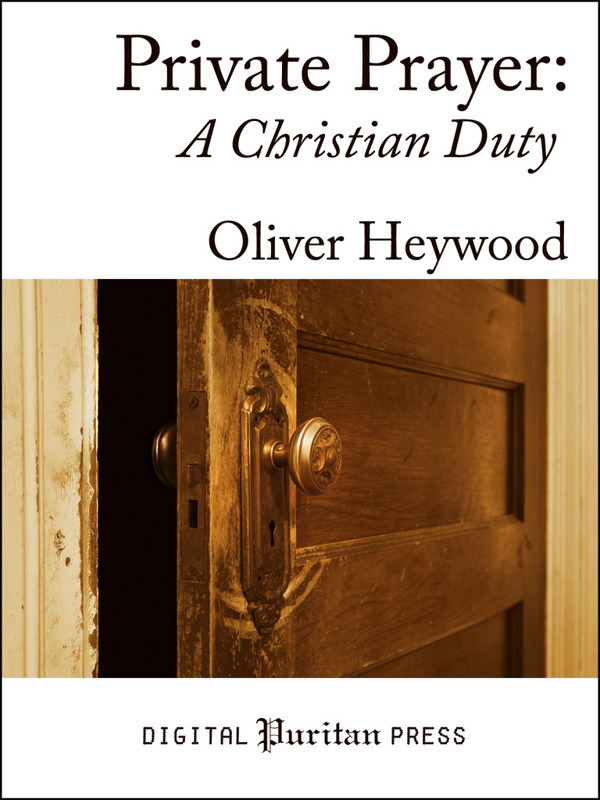 In Private Prayer: A Christian Duty, pastor Oliver Heywood illustrates the necessity of spending time in private prayer each day. Using Matthew 6:6 as his text, Heywood teaches how to cultivate a habit of daily prayer which is both refreshing and delightful. He reviews the time, place, and content appropriate for our private prayers, and answers several objections that are commonly used to excuse ourselves from praying regularly—including lack of time, cold-heartedness, wandering thoughts, and not knowing what to say. Several Scriptural instances of private prayer are explored, including the Lord’s Prayer and the mighty wrestling of Jacob in prayer (Genesis 32). Through this teaching, the believer will find resources and encouragement to help fulfill this beneficial obligation. Oliver Heywood (1630–1702) was an English Puritan pastor who was deprived of his pulpit for his Protestant beliefs. He cheerfully endured imprisonment and the confiscation of his worldly possessions so that he might bring the truth of the Gospel to his countrymen. Heywood published this book in 1671 while travelling from town to town preaching, in an itinerant ministry that spanned most of his career. Out-of-print for nearly two hundred years, this classic treatise has been carefully prepared for the benefit of a new generation of Christian readers. Even those not accustomed to Puritan works will find Heywood’s warm and engaging style both eminently useful and Christ-exalting. Not sure whether to buy it in print or digitally? This title is enrolled in Amazon's MatchBook program: If you purchase a paperback through the "Available at Amazon" link above, the Kindle e-Book of the same title is free. This entry was posted by editor. Bookmark the permalink. Copyright © 2011–2019 The Digital Puritan. Some rights reserved. Any part of this website, unless specifically indicated, may be duplicated in printed form for purposes of personal study, church study, or community evangelism. No part of this site may be duplicated without expressed permission of the rightsholder for other purposes. Please give the courtesy of an email if you would like to distribute or duplicate these resources for purposes beyond what is mentioned. If you would like to post a link on your website or blog to the articles here please do so freely. Linking to this site is welcomed. Images used on this website may be subject to copyright by their respective owners. Every attempt has been made to obtain adequate license to use images that are known to be copyrighted. If you believe an image or source used on this site is being used inappropriately, please contact the webmaster immediately.